Sister act First Aid Kit has really changed the way we view Swedish music. There are as far as possible from the synthy pop that we've come to expect from our Scandinavian friends. The duo treated us to some incredible toe-tapping roots/folk on The Lion's Roar. The follow-up, Stay Gold hit North American shores this week. It is a far more polished, less gritty product than it's predecessor. The title track is the culmination of this, a melodic with well-rounded and shiny tune. We see it again with the strong harmonies of "The Bell". The album's strongest moments are when the ladies go back to their roots influences. I'll take the weepy "Cedar Lane" or the twangy folk of "Waitress Song" over a glossy semi-orchestral number any day of the week. Unfortunately, tracks like the jangly "Heaven Knows" are the exception rather than the rule. 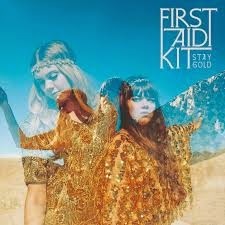 Stay Gold is an enjoyable record, but one that falls far short of the breath-taking achievement of First Aid Kit's previous effort. Best tracks: "Stay Gold", "Waitress Song"